Readers of Hoop Crazy will remember Ned as the bug-loving beanpole who lives in an isolated national park out West, three hours from the nearest basketball court. 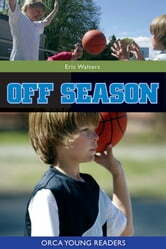 But Ned's participation in the three-on-three tournament when he visited Nick has sparked his interest in the game and now he and his father have built their own basketball court in the wilderness. And Ned's hoop skills have improved considerably. Nick and Kia are just beginning to get the hang of life in the wilderness when disaster strikes. A raging forest fire threatens to destroy Ned's home and cut off their escape.